2 fantastic Gypsy bands, an array of DJs, delicious sound system and some of the best crowds Bristol has to offer! 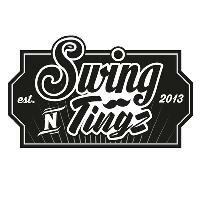 For one night only the Bristols infamous event Swing N Tingz is welcoming the sounds of Eastern Europe! Presenting to you 2 live Gypsy bands Ushti Baba and Karsilama and support from Jamie Chicken (Chicken Brothers) and Sacha Dieu the King of the London Gypsy scene. An energetic five-piece playing a lively of upbeat of music from Eastern Europe, as well as original music. Led by frenetic violin, footstomping accordion and vocals, and driven by massive drums and twisted bass, they will take you on a wild ride! Expect a night of crazy dancing and odd-time-signature-madness brought to you by an all-star lineup of talented local and international musicians from groups such as Immigrant Swing, Railway Sleepers, and The Underscore Orkestra. The indisputable King of London when it comes to DJing the sounds of the Balkan, Manouche, Klezmer and more all with a healthy spattering of bass and beats! One half of the infamous Chicken Brothers, Jamie is a DMC grade DJ who loves the sounds of Swing and loves even more the sounds of Bass.